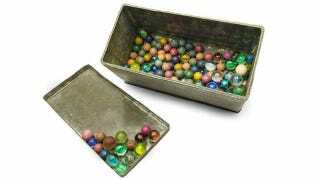 This recently-recovered box of marbles belonged to Anne Frank. This recently-recovered box of marbles belonged to Anne Frank. She gave them to her friend, Toosje Kupers, for safekeeping when she and her family hid from the Nazis — and they've been inside her cupboard ever since. Now, some 70 years later, the marbles have been found and are set to appear at a special exhibit in Rotterdam.